I tend to like what Tom Hardy does in film, with the exception of Bane in The Dark Knight Rises. I felt like even though he did a good job with the character of Bane, that damn mask restricted much of what he could portray facially with the character. 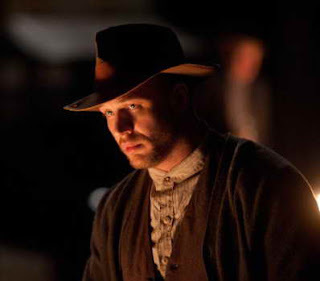 But prior to that, I saw him in Lawless, where he played the nearly unflappable Forrest Bondurant. I didn't catch him in the 2011 movie, Warrior. But how could you forget him as Eames from Christopher Nolan's Inception. Before Inception, he had been flying low under my radar. But he's had parts in films I have seen. His first credited movie, Black Hawk Down, and he was also in Star Trek: Nemesis. Right now (6-7-13), he has five movies under production. Mad Max: Fury Road where he plays Max, which is in post-production, due out in 2014. There are other things that are potentially coming up, but they're noted as being in script of pitch phases of production. There's an Al Capone role, an outlaw biker project and animal poaching film where he might be starring in and producing (with Leonardo DiCaprio). For now, we know of five Tom Hardy projects from IMDb and this week it's been reported to have landed a role in the Takashi Mike project, The Outsider. So for now, we have a few new movie projects coming up for Tom Hardy fans.